Blog Quick Quotes: Petaloo Blog Hop - Day 2! Petaloo Blog Hop - Day 2! Greetings and happy Tuesday to you! We are so thrilled to be partnering all this week with our friends at Petaloo! Hello and welcome! Susie hosting the blog today. We are offering up Father's Day themed projects this week featuring some great products from Petaloo and Quick Quotes of course! My husband is a great "Daddy" for our three children! Learning to ride a bike is an important milestone in any child's life so of course he was right there to help our baby girl develop this skill. It took a lot of patience. He actually worked with her on multiple occasions over the course of about a year before she developed the confidence to ride on her own. The small pictures on the right are from the 1st attempt on the school playground. The large photo on the left is the day she finally road up and down the road all by herself. Talk about a proud Daddy moment! The beautiful plaid background paper is from the Serendipity Collection and I inked all around the edge with Tahiti PowderPuff Chalking Ink. I placed a doily slightly off center and layered on a fancy die cut showing the reverse side of the plaid paper! Both sides were so beautiful! Creating this beautiful floral spray on the left of the layout was so easy with Petaloo products! I combined 2 different colors from the Burlap Blossoms line: Teal and Pistachio. The leaves and the pearlized berries are from the Botanica Collection. A pearl flourish and wood accent finish the embellishment cluster. Petaloo also has a nice collection of Fancy Trims and I layered 2 of them - some teal ric rac and a piece of beige lace - on top of a torn strip from Baggage Claim. 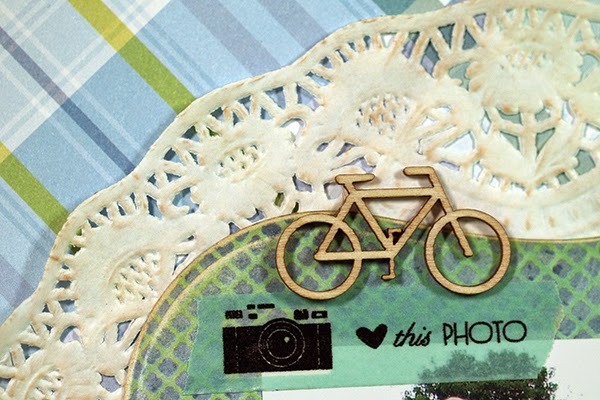 Those cute bikes were perfect for this layout! I added a second torn strip and then inked the edges with Rusty Nail PowderPuff Chalking Ink. "Daddy's Little Girl" came from a Quick Quotes Vellum I had in my stash! The Polaroid frame from the Baggage Claim Chipboard Die Cuts was the inspiration for all of the Polaroid's on the layout. The quote on the piece talks about adventure. My daughter thought I meant learning to ride the bike. I had to explain that I was actually referencing being a parent, having a family - an adventure I hope she one day enjoys herself! Here's a closer look at the bit of washi and wood veneer bicycle at the top. You can see that the die cut was embossed and distressed before I inked it with Rusty Nail PowderPuff Chalking Ink. I also inked the doily a bit to add a little "character". Thanks for stopping by the Quick Quotes blog! Please be sure to stop on over to visit our friends at Petaloo next! p.s. I hope you find sometime to play today! What's a Blog Hop without a few Prizes?!!! Winners will be announced on Monday, June 16. Great layout, love the colors and layering of items. I adore anything with bikes on it. This layout is adorable. Loved your layout! Reading about your husbands journey and proud moment brought back memories from my past and made me smile, thanks! 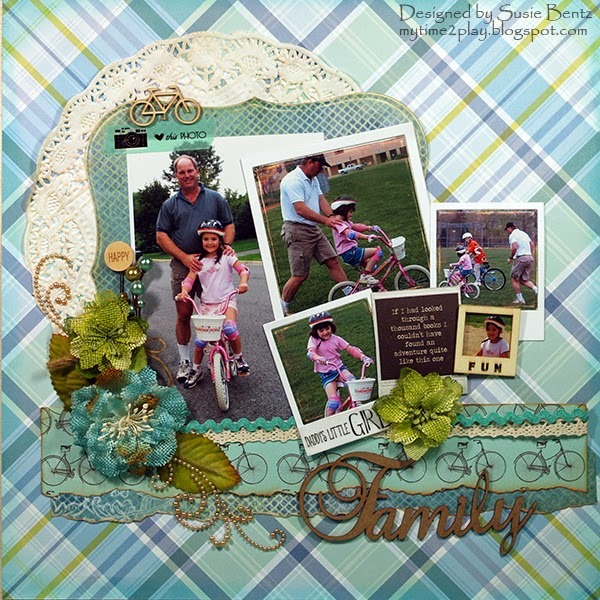 Beautiful layout and love the paper from the Serendity Collection!! there are so many great artists out there, thanks for sharing with us. Great layout, so sweet father/daughter. Love the paper & quote. Fabulous layout. Love the chalk inks, they are one of my favorite ways to edge. The paper is beautiful, and the flowers are just scrumptious. Great job! There are so many pretty elements to look at on this layout! What a great layout, back ground is lovely. I love the colors on this! I love the layout and oh the pistachio color really sets it off! I love your layout! Such sweet pictures of your daughter learning to ride her bike with Daddy helping. Thanks for sharing with us. Great looking LO with cool pics and embellishes. Fantastic layout! I love the layering and flowers. Love the flowers and ink colors!! Yea, I found where to leave comments. On the Petaloo blog I couldn't find a comment section. This layout is beautiful. Love those flowers. WOW! What a gorgeous layout!! Your daughter is going to cherish this when she is older and Dad will cherish it now!! Beautiful job capturing such a sweet moment! TFS! I shared on FFB, commented on Petaloo's blog, invited friends, pinned and left a message on FB! Thanks for the chance to win some awesome goodies! Super cool layout, so beautiful. Thank you for sharing. fantastic layout, is so beauty! This is great! I love all of your embellishments! This is a beautiful layout, I especially love the layers! Love, love ,love your layout! Great photos...cool layers! Love the layout, love , love, love the Petaloo burlap flowers, and that plaid from Seredipity ... OMG just awesome... LOVE the colors !!! Super cute layout and I love the Petaloo flowers.